This bright and glistening red beauty is an eye catcher! 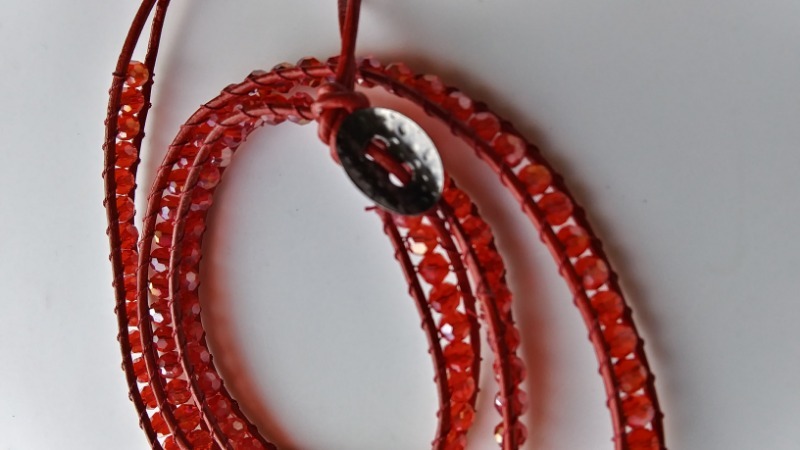 It's a 22" length from the fastening button made of a row of red translucent glass beads. These faceted sparkling beauties vary slightly and catch the light from many angles. Good quality leather red cord frames the candy colored beads which are secured by the strongest natural fiber available; silk thread. There are tiny knots secured by small dabs of adhesive. Your piece is fastened by a metal curved and hammered button to the looped cord. Stunning!